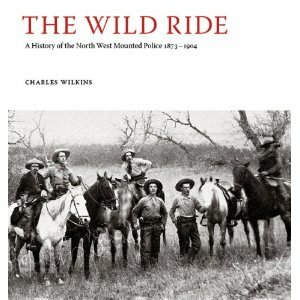 The Wild Ride: A History of the North West Mounted Police 1873–1904 is an engaging and handsomely illustrated book directed at general readers. Author Charles Wilkins is a writer whose previous books (fifteen to date, with another on the way) have documented, among other things, his adventures in grave-digging, joining the circus, and walking from Thunder Bay to New York. Before embarking on this project, Wilkins was reportedly hesitant to write about this period of history. As Rob Alexander from Rocky Mountain Outlook writes, “Wilkins considers himself a storyteller, and given the event’s importance in Canadian history, he felt the story might best be left to historians and academics.” While I am not sufficiently well-read to evaluate how this book fits within the larger historiography of Canadian and Mountie history, as a general reader and a museum professional, The Wild Ride appealed to me in a number of ways. Composed entirely of thick glossy pages, this book invites browsing and reads like an exhibition catalogue. Nowhere does the main text occupy an entire double-page spread. Instead, paintings, illustrations, documents, photographs, and artifacts adorn each page, serving to extend and corroborate Wilkins’ narrative. Bonus marks should be awarded for including institution-specific reference numbers for all reproduced source material. Publishers Stanton Atkins & Dosil describe their purpose as “creating beautifully illustrated and vividly written books about Canada.” With special credit to designer Roberto Dosil, they have accomplished both with The Wild Ride. no person or institution contributed more to the transformation of the territory than a few hundred men in red coats. … In their enthusiasm, and often their naivete or ignorance, they early Mounties did what they were told to do, or felt needed doing, in the push to make one world disappear and another come into being (unpaginated front matter). The book opens on the Red River Rebellion and the events leading to the execution of Thomas Scott. Wilkins moves through the narrative at a romp, weaving situational overviews with the motivations of historical actors. He mixes the grandiosity of the NWMP’s given task of taming the western lands of Canada with the day-to-day reality of the recruits and those they were charged with policing. The result is a substantial and playful account that, while not exhaustively rigorous, is demonstrably well-researched. The story ends following the Klondike gold rush and the “fading of the frontier period of Canadian history,” marked by the creation of new provinces and attendant provincial police forces (226). Throughout the text, the activities of the NWMP are amply contextualized (it is telling, for instance, that thirty-five pages elapse before the creation of the force is mentioned). Related background information is covered in frequent inset pages on topics such as: Red River carts; early standard issue weapons; the Blackfoot Confederacy; and Klondike gold mining methods. Additionally, portraits and artifacts introduce people and concepts from the margins. Typically, when I read history written without references, I still look and wish for footnotes (even though I understand the many reasons to forego inline citations). The Wild Ride mollifies my desire for constant substantiation by reproducing evidence on every page. Except for a few minor points, there is little to criticise about this book as a colourful and accessible history of the NWMP. At times, the writing feels excessively anecdotal. Furthermore, a timeline would have helped anchor the chronology amidst all the ways to be pulled out of the main account. Overall, however, this is a pleasing book in form and function, with the inclusion of material culture a particular highlight. Emily Beliveau holds a BA in History from Concordia University and a master’s degree in Museum Studies from the University of Toronto. Pingback: Want to Review a Book for ActiveHistory.ca?